FDA chief says voluntary action from industry isn't enough. The makers of e-cigarettes are facing new government restrictions on how the popular liquid nicotine products can be advertised and sold, with a top federal regulator making clear that industry hasn't done enough to keep vaping devices away from young people. The U.S. Food and Drug Administration already bans the sales of e-cigarettes and tobacco products to those under 18. And some states have gone farther, restricting sales to customers over 21. But FDA has made clear that it doesn't think enough has been done to prevent a new generation of Americans growing up addicted to nicotine. The agency has called out what it calls an "epidemic" of e-cigarette use among minors and has announced a Dec. 5 public hearing on the subject. "We will take additional actions in the coming months to address the public health concern of youth e-cigarette and other tobacco product use with the goal of slowing and ultimately reversing these troubling trends," the FDA said earlier this month. (Suzanne Kreiter/The Boston Globe via Getty Images) A Juul e-cigarette is pictured for sale at Fast Eddie's Smoke Shop in the Allston neighborhood of Boston, Nov. 15, 2017. Shoppers must be 21 years of age. Concerns are growing over underage use of the new easy-to-conceal form of e-cigarette that looks like a thumb drive. 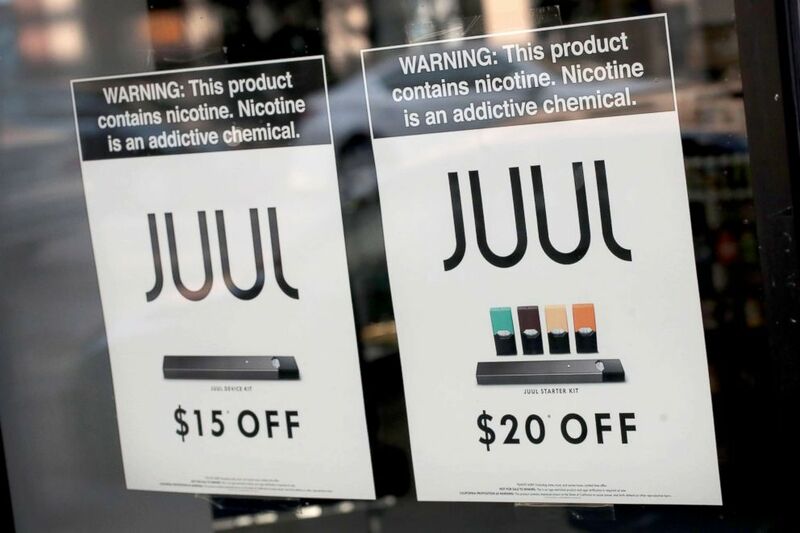 Juul, the nation's leading producer of e-cigarettes, tried to fend off additional regulation this week when it announced it would stop selling flavored vaping devices popular with younger consumers, including mango, fruit, creme and cucumber. The company says it will only sell those flavors online and is setting up a system that would independently verify a person's age before allowing the sale. "We don’t want anyone who doesn’t smoke, or already use nicotine, to use JUUL products," according to a company statement posted online. "We certainly don’t want youth using the product. It is bad for public health, and it is bad for our mission." But Scott Gottlieb, head of the U.S. Food and Drug Administration, said the actions by Juul wouldn't be enough. "We're deeply concerned about the epidemic of youth use of e-cigs," he tweeted. "Voluntary action is no substitute for regulatory steps #FDA will soon take." (Scott Olson/Getty Images) Signs in the window of the Smoke Depot advertise electronic cigarettes and pods by Juul, the nation's largest maker of e-cigarette products, Sept. 13, 2018, in Chicago. Last month, the FDA raided the San Francisco headquarters of Juul Labs, looking for documents related to the company's marketing practices. 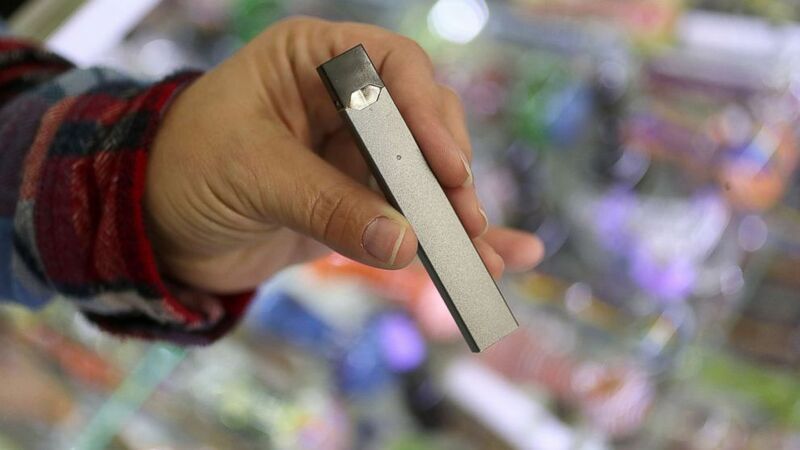 The federal regulator had been investigating whether Juul violated the law by targeting minors through its advertising and flavored products. Gottlieb said he still supports policies that would help adult smokers quit, including the encouragement of adults addicted to traditional cigarettes to transition to e-cigarettes. But, he adds, "I won’t allow policy accommodation we take to promote innovation to come at the expense of an epidemic of use of tobacco products by children. We are now witnessing that epidemic."